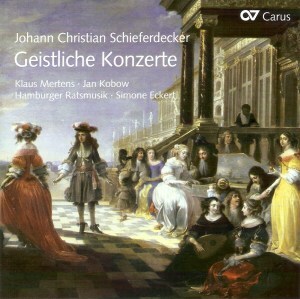 Johann Schieferdecker was born in Central Germany in 1679, the son of a music director and organist. He studied in Leipzig where two of his early operas were performed, then moved to Hamburg where he worked with his childhood friend and fellow composer Reinhard Keiser. Not long after Schieferdecker's arrival in the city a certain G.F. Handel arrived and a dramatic increase in opera production took place in the city. It was Schieferdecker who accepted the job that Handel and his colleague Mattheson had turned down - that of assisting and eventually succeeding the ailing Buxtehude in Lubeck, on condition that the successful applicant marry Buxtehude's daughter. This famous story is often told, but almost always minus the Schieferdecker connection. This disc presents not the operas Schieferdecker wrote, many of which are now lost, but three surviving cantatas for bass and strings, one for tenor, and two orchestral concertos. The vocal works largely exemplify Buxtehude's vision of 'opera in church'. That said, the vigour is accompanied by a rigorous concision to produce music of short-breathed intensity. Triumph, triumph Belial ist nun erleget is a blueprint for this Hamburg-Lubeck aesthetic and it may well remind one of Handel's early works, too. Sonorous and adeptly accompanied, it ends with a ripe chorale. Auf, auf, mein Herz is even more brief but certain distinguishing qualities can easily be noted: the way the strings shadow the vocal line, the genial 'swing' of the aria Da unser Feld - simple and brief - and the assured concluding chorale: these are three of the most obvious. The tenor cantata In te domine speravi asks more technically of the singer, by way of the divisions, than the bass cantatas. There's also a concertante role for the first violin in the Quoniam, which gradually slows ingratiatingly; this work in particular may well reflect the influence of the younger Handel. The orchestral concerti are nimbly characterised works published in 1713. Their graciousness and melodic invention recall Telemann - no bad thing - but also illustrate Schieferdecker's facility and good spirits. The cantatas are sung by Klaus Mertens, a notable Bachian, and tenor Jan Kobow, with a welcome lack of histrionic intervention and fine tone. Simone Eckert, the viola da gamba player, directs the Hamburger Ratsmusik with incision and a sure feeling for the music's line.